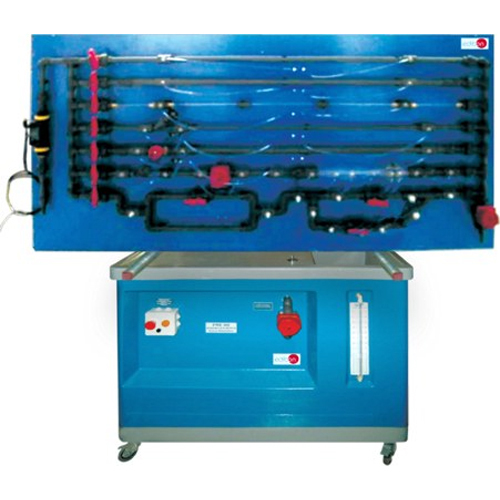 fluid flows through pipes, fittings and flow metering elements. numbers (from 2 to 16), to avoid connection errors. Single cable between the control interface box and computer. involved in the process. Calibration of all sensors involved in the process. Real time curves representation about system responses. Storage of all the process data and results in a file. Graphic representation, in real time, of all the process/system responses. computer screen. Shield and filtered signals to avoid external interferences. Digital Input/Output: Number of channels=24 inputs/outputs. D0 or DI Sample Clock frequency: 0 to 1 MHz. Compatible with actual Windows operating systems. Graphic and intuitive simulation of the process in screen. passwords to facilitate the teacher’s control on the student, and allowing the access at different work levels. Anodized aluminium structure and panel in painted steel. Rapidity and facility to replace parts of the unit, in the case of failure or breaking. Rough pipe 17 mm. diameter (PVC). Rough pipe 23 mm. diameter (PVC). Smooth pipe 6.5 mm. diameter. (methacrylate). Smooth pipe 16.5 mm. diameter (PVC). Smooth pipe 26.5 mm. diameter (PVC). 2 differential pressure sensors. Range: 0-30 psi. Accuracy: 0.4 cm. 2 pressure sensors. Range: 0-30 psi. Accuracy: 1 cm. Flow sensor, range: 0-150 l/min. Inclined seat valve. Floodgate valve. Ball valve. Flow regulation valves. Venturi tube of transparent plastic. Two 90º elbows (in S). Pipe section with a Pitot tube and static tapping. 50Hz or 110V./60Hz. Runner made in stainless steel. Sump tank capacity: 165 litres. litres for high flow values. Control valve for regulating the flow. Remote hand-operating dump valve in the base of the volumetric tank.